Housing your rabbit indoors promotes socialization with other family members and keeps your pet safe from predators and bad weather conditions. Rabbits are known to hide illnesses, House Rabbit Society says, allowing little time to respond when they get sick, but an indoor habitat means frequent interaction with your bunny, so it's easier for you to monitor your rabbit's health, eating and behavior. Bunny’s habitat should be 4 to 6 times his size when he’s fully stretched, House Rabbit Society advises, which is much bigger than many of the “starter kit” rabbit cages sold in pet stores. Minimally, your rabbit’s indoor cage or hutch should have space for a litter box, food and water bowls, and toys. 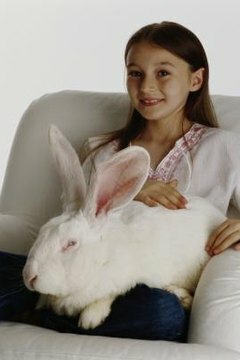 Bunnies need space to stretch out as well as room for exercise and play, and a small, 5- or 6-pound rabbit should have a cage that's at least 30 inches wide by 30 inches deep by 24 inches tall, according to the Indiana House Rabbit Society. An opening on the side or front of the cage allows easy exit and re-entry during playtime, and an opening on top of the cage provides easy access for cleaning. Avoid wire-bottom cages as they can be hard on your rabbit’s feet, and provide plenty of hay or litter for nest-making, digging and burrowing. Metal-wire dog crates make wonderful rabbit cages while also offering protection from other family pets or small children. A bunny shelf, accessible by a ramp, can be placed in the back of the crate to provide your rabbit with a comfortable perch. Indoor rabbit hutches and rabbit condos can range from simple to elaborate. Many rabbit habitats are available as kits for purchase and can be readily assembled, while others are custom designed. Some families opt for a raised hutch to avoid stooping and kneeling to care for their bun. Add movable steps or a ramp to give your rabbit easy access in and out of his habitat. Multi-level rabbit condos can be purchased as a kit or you can create your own. Pens provide space for your rabbit to exercise and can be set up indoors as a play area or as a permanent habitat. Some families construct elaborate pens and play areas for their bunnies, but a simple puppy pen will also do the trick, suggests House Rabbit Society. A 4-by-4-foot pen will hold everything your bunny needs including a litter box, food and water dishes, toys to satisfy the need to play and chew, as well as a house or box where your rabbit can retreat for privacy. Opt for a metal wire -- rather than plastic -- pen to prevent your rabbit from chewing through.